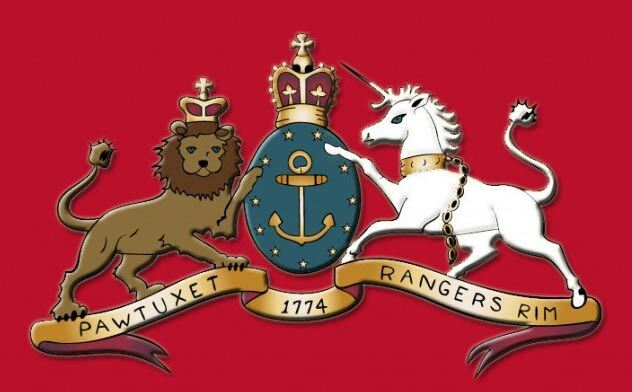 The Pawtuxet Rangers were chartered in 1774 to protect the thriving seaport of Pawtuxet, and at various times throughout the Revolutionary War manned the fort on Pawtuxet Neck, a function vital to the defense of both Pawtuxet and Providence. As the war progressed, the Rangers were called upon to participate in major engagements in other areas including the Battle of Rhode Island and the Battle of Saratoga. The Pawtuxet Rangers are among the oldest existing chartered commands in the country. Under the overall command of the Governor as Captain General, and the direct command of the Adjutant General of the Rhode Island National Guard, the Rangers still retain the independent status of their charter while also available on a voluntary basis to assist in certain State functions if so requested. The Pawtuxet Rangers are among the most active of Rhode Island’s militia groups. They are constantly sought for participation in a wide variety of parades and public appearances, including ceremonial State functions, battle reenactments, and speaking engagements. The flintlock muskets of 1774, the scarlet and gold regimental coats and cocked hats provide dramatic impact whenever the Rangers appear in public. Fired in vollies, the sheets of orange flame and clouds of smoke from the muskets bring excited responses from spectators along parade routes. http://www.pawtuxetrangers.com/wp-content/uploads/2016/01/01track1.mp3 Learn more about the CD and purchase a copy for your enjoyment and support the Pawtuxet Rangers. The Pawtuxet Rangers are among the most active of Rhode Island's militia groups and are one of only four fife and drum corps in the United States that are part of an actual military organization. Today the Company has Militia including color guard, musket line and artillery and a Fife & Drum corps.